A Demon Dragon Digimon that is called the "Deep-crimson Demon Dragon". The childishness it had when it was Guilmon has vanished, and it evolved into a wilder, more brutal Digimon. 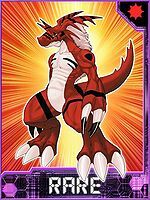 Also, although it is a Virus Digimon, it may even battle for justice depending on how it was raised by its Tamer, because it will be faithfully obedient. Growmon's roar has the power to shake the solid earth, and before battle it raises its voice to an offensive roar to intimidate the opponent. Its Signature Move is developing plasma along the blades on both of its elbows, then striking the opponent (Plasma Blade). 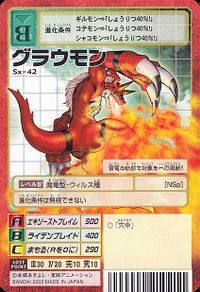 Its Special Move is spewing out a powerful blaze with a roar (Exhaust Flame). Because it has accepted and contained the extraordinary power of the "Digital Hazard" within itself, and that its attack instinct as a Virus-species enhanced further, it will exhibit a ferocious nature where it is unable to control its overflowing power, changing its personality into one on a thin line with justice depending on how it grows up. However, Growmon's power has clearly increased, and the blades on both of its elbows have enlarged even more, developing and causing plasma to appear when attacking the enemy. Its Special Move is the destructive energy produced from the "Plasma Blades" on both of its elbows (Raiden Blade). 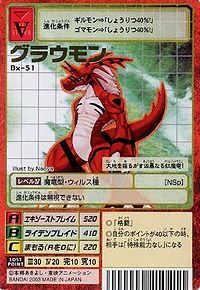 A Demon Dragon Digimon that is called the "Deep-crimson Demon Dragon". It will faithfully obey its Tamer, and even battle for justice depending on how it is raised. It fights by causing enormous blades to appear along both of its elbows by means of the extraordinary "power" contained within it. Special Move: Generates destructive energy from the enormous "Plasma Blades" (Raiden Blade). n.,Short for growl (「グラウル」 gurauru) . Exhaust Flame  エキゾーストフレイム Ekuzōsuto Fureimu Pyro Blaster Spews out a powerful blaze with a roar. Charges the blades on its forearms with plasma and slices the enemy with them. Releases destructive energy from its plasma blades. 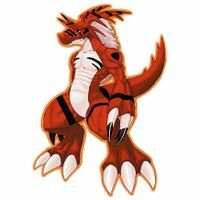 Evolves from Guilmon X-Antibody or Ryudamon. Can evolve to Hisyaryumon, Mametyramon, Megalo Growmon X-Antibody, Skull Baluchimon, or Triceramon X-Antibody. 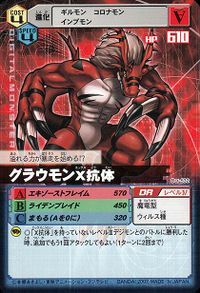 Can also Jogress with Ginryumon to evolve into Hisyaryumon. It bisects its target with a single slash, leaving trails of electricity! This violent crimson dragon shakes the earth! Its overflowing power has caused it to go on a rampage!? This page was last modified on 18 March 2019, at 12:22.